Waking up early in the morning for a brief 15-km cycling, I think it was time to take up drawing pen again, after days of continuous brush drawing. It’s true what Aji said. After a period of using brush, using pen feels so easy. The fluidity of my drawing movement was undeniable. I felt it so vividly I was nearly able to grab it in my hands; if you know what I mean. Conan’s axe is based on my own Black Wolf tomahawk. Not really accurate for the Hyborian era, maybe, but I always find a tomahawk a very flexible battle-axe, easy to use. 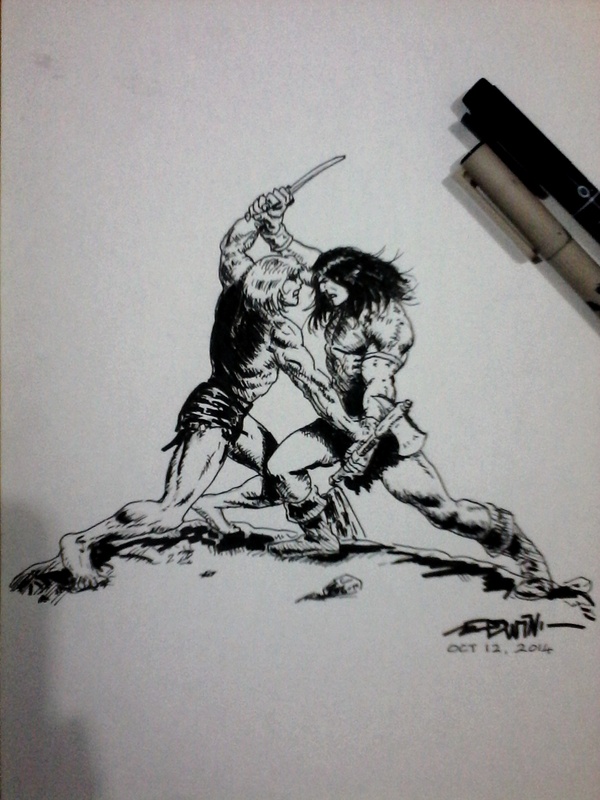 If I were Conan, that’d be the battle-axe of my choice. The scene itself is a part of The Queen Of The Black Coast story line, depicting a fight between Conan and the lion king who abducted Belith. Any of you remember the name of that character? ~ by edwinlives4ever on October 12, 2014. Hands are a bit distorted, though.